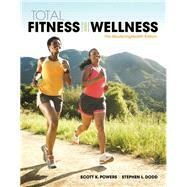 by Powers, Scott K.; Dodd, Stephen L.
The 7th Edition provides a clear learning path, labs that can be completed and submitted online, and a thoroughly revised guide to creating a comprehensive fitness and wellness plan, ensuring students and instructors have the print and online tools they need to succeed. To take advantage of the power of Mastering, every chapter of the text includes numbered Learning Outcomes and a new study plan that ties directly into Mastering™ Health activities. This title is also available with Mastering™ Health--an online homework, tutorial, and assessment program designed to work with this text to engage students and improve results. Interactive, self-paced tutorials provide individualized coaching to help students stay on track. With a wide range of activities available, students can actively learn, understand, and retain even the most difficult concepts. Total Fitness and Wellness , 7th Edition is also available via Pearson eText, a simple-to-use, mobile, personalized reading experience that lets instructors connect with and motivate students – right in their eTextbook. Learn more. Scott Powers holds the title of distinguished professor, and is also director of the Center for Exercise Science at the University of Florida. He has been teaching for over 20 years, and was named Teacher of the Year at UF in 1992. Scott served as president of the Southeastern Chapter of the American College of Sports Medicine in 1986, and is the co-author of another textbook, Exercise Physiology, 6th edition, published by McGraw-Hill. As a member of the Gatorade Sports Science Institute (GSSI) Sports Medicine Review Board and the editorial board for the Journal of Applied Physiology, Medicine and Science in Sports and Exercise, the International Journal of Sports Medicine, and the International Journal of Sport Nutrition and Exercise Metabolism, he is a well-known and highly respected individual in the field of exercise physiology. Stephen Dodd is the Chair of the Department of Applied Physiology and Kinesiology at the University of Florida. He has been teaching for more than 20 years, and has won numerous awards, including the Teacher of the Year award in 1997. He has won the annual “Instructional Resources Grant” from UF every year since 1991, allowing him to make innovations in use of multimedia in his classroom. He has held numerous chairs in committees at UF. The Powers/Dodd, Total Fitness & Wellness, Brief, Fifth Edition , (0134378253 / 9780134378251), includes eleven total chapters consisting of Chapters 1—11 of this Seventh Edition.